I obtained this soundrack around the same time I first learned how to make MP3s from vinyl, something which resulted in me emailing the title track to everyone I knew with the accompanying message "LISTEN TO THIS!!" 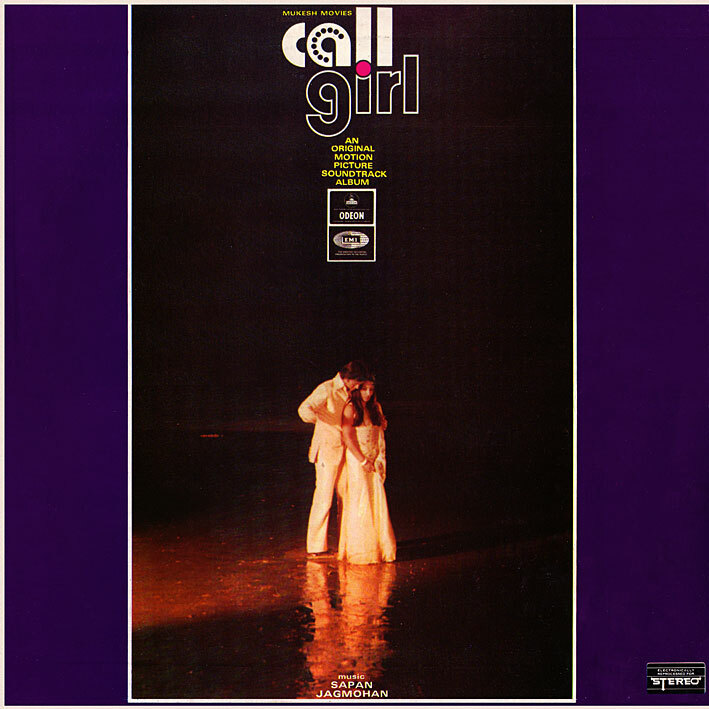 'I Am A Call Girl' was, and still is, one of my favourite Bollywood tracks; the combination of seedy lyrics (sung in English by Ranu Mukherjee, whom I otherwise know nothing about) and its relentless, supercool jazz groove just blew me away. A fantastic track, at the time almost making me neglect the rest of the album. For there are other great tracks here. 'Jawani Mere Yara' (lively mod-soul), 'Dil Jale' (peppy lounge-pop) and 'Cabaret Dance' (frenzied psych-jazz) all contribute to making 'Call Girl' [review] a soundtrack it would be foolish to miss out on. Scored by a composing duo with a relatively modest filmography, but whom I'd be keen to hear more by. Incidentally, 'Call Girl' is also one of not very many Bollywood movies I'll likely watch at some point, partly because I own a DVD copy, but also because it's actually less than two hours long. Incredible. at least the songs I have from 60s and 70s. Ranu Mukherjee is Hemant Kumar's daughter. Thanks PC for this album...I just love the song "Hum Hain Jahaan"..that's one of my fav Kishore - Asha duet. Thanks for all the recent LPs!!! All your collections have been fantastic.. for a layman like me it has been a treasure. Dear PC. Thanks for sharing these numbers. I was wondering if it's LP or EP. Please let us know.